The SecureFit has an ultra small footprint so the actual size of the keyboard is all the space that is needed. The clamp/squeeze design holds any keyboard from 5" (127mm) - 9" (228mm) deep, firmly in place. The SecureFit provides precise mouse positioning without all the tools. The mouse can be adjusted for left or right handed users and width adjustments are made easily, eliminating any need for user reach. To optimize your mousing experience, the SecureFit is also offered with the Merlin Mouse, providing you with an infinitely customizable mousing solution. The added features of the Merlin Mouse allows mousing to be done above, below or level to the keyboard. 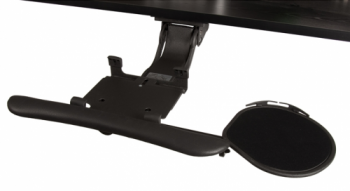 It also swivels for horizontal adjustment from front to back and tilts independently from the keyboard. All of the great features and the sleek low profile design of the SecureFit makes this clamp the perfect choice when paired with one of our mechanisms, to make the perfect combo.